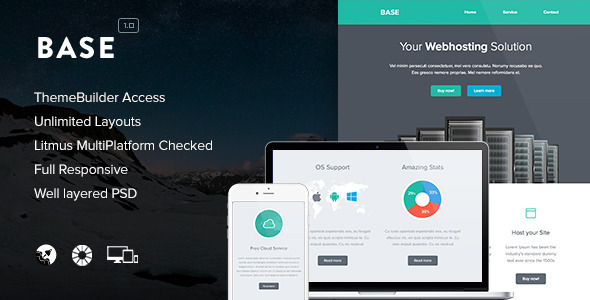 Base – Video Email + Themebuilder Access Created by RocketWay. This templates have specific characteristics, namely: Base has features such as Compatible Browsers: Gmail, Yahoo Mail, Microsoft Outlook, Thunderbird, Hotmail, Apple Mail, Compatible Email Services: MailChimp, Campaign Monitor, Columns: 4+ . You can use this Base – Video Email + Themebuilder Access on Marketing category for android, app, apple, base, campaign monitor, domain, hosting, html5, icontact, iphone, mailchimp, promotion, rocketway, themebuilder, video and another uses. Replace your .mp4 URL in the first input field on the left menu called “Video”. The .mp4 video is showing in your Email and on the web in the Safari browser. Replace your .ogg or .ogv URL in the second input field on the left menu “Video”. The .ogg or .ogv videolink isn’t mandatory but we advice to add this video format to support a range of webbrowsers (like Firefox or Google Chorme). Replace your fallback image in the third input field on the left tab called “Video”. The fallback image is meant for Email clients that don?t support html5 videos in Email so your image will be shown. MailChimp don’t accept HTML5 video’s, it’s impossible to send an email with video through their system. If you export your file as a MC file you will see a normal 600 pixel fixed width image (like the fall-back image). The HTML5 video is working when sending your email through Campaign Monitor, Constant Contact, or some other Email platforms. You can check the Autoplay button if you want to send your Email with a Autoplay function. If you don’t understand how to convert a video we advise to use an video converter on the web (like clipconverter.cc) or download an video coverter App. If you don’t have a video URL yet, no worries, we have a test .mp4 and .ogv URL so you can see it works. Copy paste this URL: http://www.rocketway.net/video/marketing.mp4 in the first input field on the left menu “Video”. Copy paste this URL: http://www.rocketway.net/video/marketing.ogv in the second input field on the left menu “Video”. Optional width for the overlay image: 600px width x 329px height. Regarding the frequent question where to find the full version of our themebuilder here’s a quick explanation: In the download you?ll see a folder called ?Themebuilder? open it and click on the link to get access to the full unlocked themebuilder. Note: The Themebuilder files aren’t included, the download includes a link which gives you access to the Themebuilder. We are people who love to improve their work, please give us some feedback if you have a great idea to improve this theme with an update (ie. a certain element you miss), it?ll be great to hear from you!